These pests are responsible for millions of dollars in damages to our homes and businesses every year with their droppings, which contain corrosive uric acid. Pest birds can also be quite hazardous to our physical health in several different ways. Their droppings can be slippery and can cause people to fall and seriously hurt themselves. Bird feces can also release spores into the air that are very dangerous when breathed into our lungs. Pest birds are also known for spreading parasites like fleas, ticks and mites. 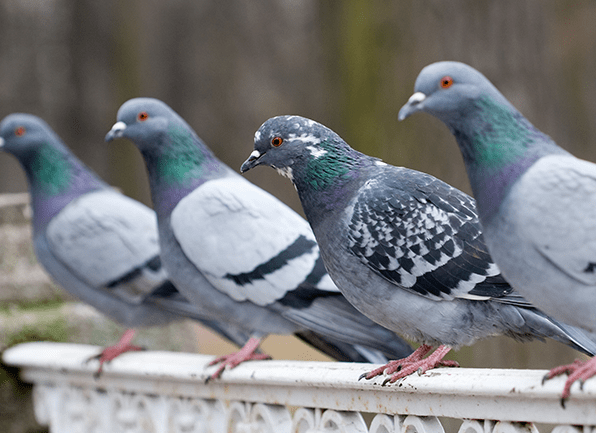 Pest birds like pigeons are active year round and can be found in all areas where humans live, including urban, suburban and rural environments. They are creatures of habit that choose to roost in the same places again and again. When in large numbers, pest birds like sparrows can be incredibly noisy. Pest birds can spread diseases that include histoplasmosis, chlamydiosis and salmonella. Making the environment around your structure unfavorable to pest birds can keep them from roosting. This can include installing exclusion tactics and structural modifications. Eliminate food sources that birds may be attracted to, including pet food, bird food and garbage cans. Keep areas where they may want to nest covered, including gutters and flat roof spaces.